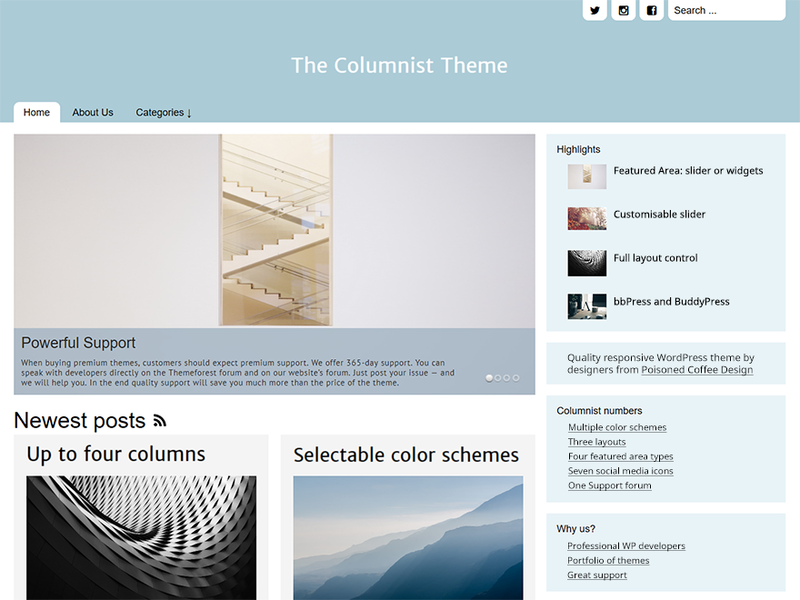 The Columnist is a responsive elegant blog and magazine-style theme. It includes customisable slider, three widget areas, selectable colour schemes and multi-column layout. If you find a bug — I will fix it. The Columnist is free and can be used for commercial projects. If you want even more features and want to support me as a developer — consider buying the Columnist Pro theme: premium version of this theme with user-selectable colours, breadcrumb navigation, incredible premium widgets and a year of support. I also offer paid installation and customization service for the Typist Theme. Simple installation and customization of my theme for your blog costs only $99 and will take 1-3 days. Use contact form below to message me. Mention that you want paid support and describe what exactly you want. I accept payment via PayPal. If you need more significant customization, creation of child themes or custom plugins – check my solutions or contact me for a custom quote!